Whether planning a big home improvement project or constructing matching costumes for your local theater group, buying fabric wholesale is a popular practice for saving money on large amounts of fabric. Wholesale fabric is sold in bolts that range from 15 to 20 yards, although some companies sell bolts as large as 100 yards. Woven and knits are usually 45 or 60 inches wide, though sometimes quilting fabric is sold as 36 inches wide. When buying wholesale it is important to check the fabric for the same qualities you check when shopping in smaller qualities: crispness, drape, color and stretch. The easiest way to find wholesale fabric is to do an online search for stores that carry them. When working with online suppliers, you have a wide choice of fabrics and easy delivery options. Upholstery fabrics are particularly popular on these Internet shops. Request fabric swatches (small sample squares) before ordering entire bolts, because computer monitors are inconsistent in representing color. 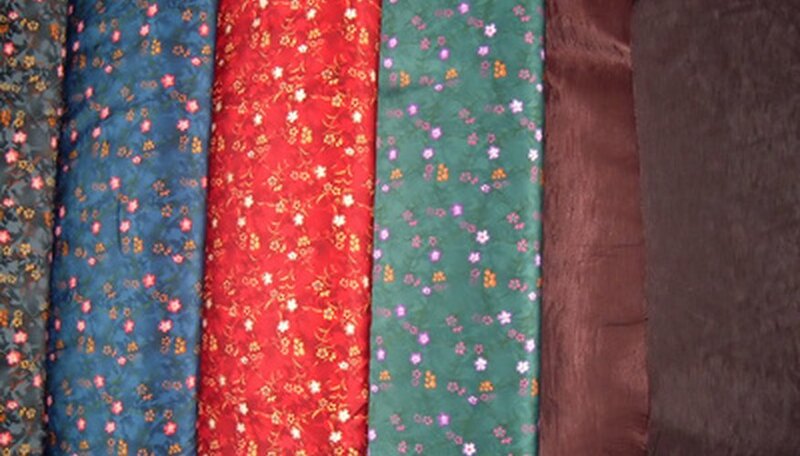 Manhattan's Garment District offers many wholesale fabric buying options. Wholesale fabric stores line 37th and 38th Streets between 5th and 8th Avenue. The selection varies, but most stores feature a good choice of knit and woven apparel fabric. Go into the garment district with specific ideas and speak directly with a sales associate when possible. Otherwise, these stores can be overwhelming with their long rows of fabric.